I wanted to thank you again for your life-changing Cleveland Nutrition program. I’m 58 years old. I was diagnosed with diabetes, high blood pressure, and high cholesterol at 38 years old and started on all the medicines. I had tried all the low fat and low carb diets without success. 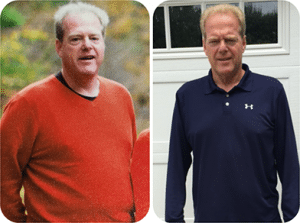 When I started this program on February 29th I weighed 225 pounds, was taking 34 units of insulin, 40 mg of Atorvastatin (cholesterol medicine), and 40 mg of Lisinopril (high blood pressure medicine) daily. Four months later I now weigh 183 pounds, take 0 insulin, 0 cholesterol medicine, and 0 high blood pressure medicine. I lost 6 1/2 inches in my abdomen. I feel great, have excellent energy, and sleep better than ever. All aspects of my life have improved. At first it was hard to do but after a few weeks in it became very easy. This was one of the best decisions I made in my life. I look forward to living this lifestyle for many more healthy years. I want to thank you again for your knowledge and unparalleled dedication.